I have been away for a month travelling through Australia and New Zealand, so have followed the recent drama from afar. I cheered when we topped the table. Was horrified to hear of the dreadful attack on Nic Cruwys, my thoughts remain with him and his family. I was also greatly saddened to hear of the loss of Guy Judge, a passionate Watford fan and friend to many. He will be greatly missed by his Watford friends and family. After so long away, it was a little odd to be setting off for a game again. I left far too early and managed to forget my replica shirt. When I arrived in the pre-match pub in rainy Derby, there was no sign of my companions, so I went to look upstairs but was told it was closed until 6. I then heard my name being called …. from upstairs. The security man looked shamefaced, “There have been infiltrators,” so I ducked under the guard rope to join my party. When a couple more infiltrators arrived soon after, Mr Security gave up and opened the upstairs bar. When we reached the ground, there was a terrific atmosphere in the concourse. And, when the players came out, they were greeted with ticker tape, balloons and streamers. There was no mistaking how important this game was to the travelling fans. The starting line-up was Gomes, Hoban, Angella, Cathcart, Motta, Guedioura, Watson, Layun, Ighalo, Deeney and Vydra. Watford old boy, Forsyth started for Derby with former loanee Thorne back from his long-term injury. 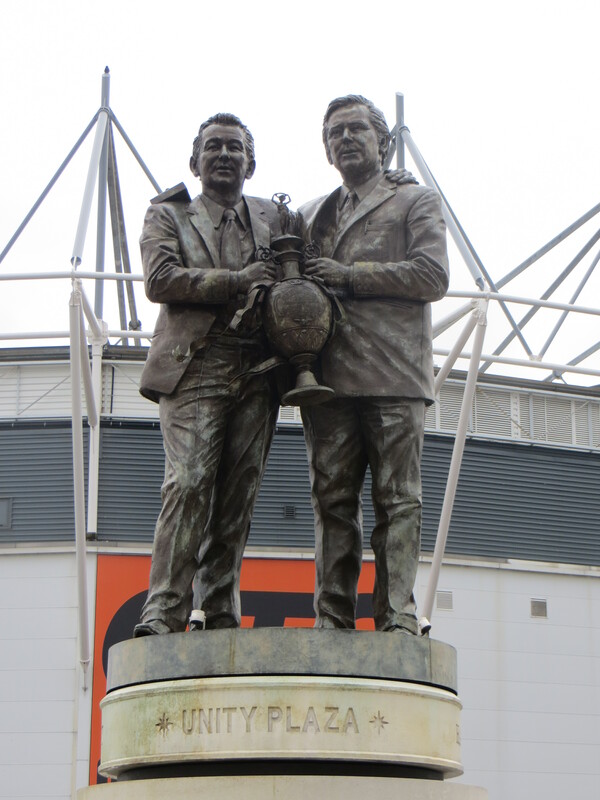 The first notable incident was an early card for Ben Watson who lost out to Bryson and hit back with a late tackle. Watford’s first goal attempt came on 11 minutes when Deeney got on the end of a Layun corner but directed the ball wide of the goal. At the other end, a Bent shot was deflected for a corner. From the set piece, the ball was cut back to Bent but Gomes was alert, stuck a foot out and turned the shot around the post. At the other end, Ighalo tried a shot from distance that was deflected wide. Then Deeney won the ball on the right and advanced but there was no Watford player in the box to meet his cross. Deeney had another chance to put the visitors ahead with a header from a Motta cross, but he directed it straight at Grant in the Derby goal. Watford took the lead on 23 minutes as Vydra won the ball, played it to Ighalo then advanced into the box to receive the return and blast it past Grant to send the travelling Hornets into delirium. There were chants of “We are top of the league,” but it was far too early for that. Hughes had a chance to equalize almost immediately as his shot from distance was just narrowly wide of the target. Thorne’s return to action didn’t last very long as he had to be replaced by Hendrick. Bent broke into the Watford box, but he didn’t have the ball under control so Gomes was able to come and gather the ball. Ince tumbled dramatically on the edge of the box and, with the crowd shouting for a penalty, Watford launched a counter attack where a ball over the top to Deeney led to a collision between the striker and the keeper. At the other end, Bent had another chance with a header but he’d mistimed his jump so it was well wide of the target. Another Derby attack was thwarted as Angella tackled with a back heel, total class. The Derby forwards were then frustrated by some diligent harrying from Vydra putting in a shift in the defence. 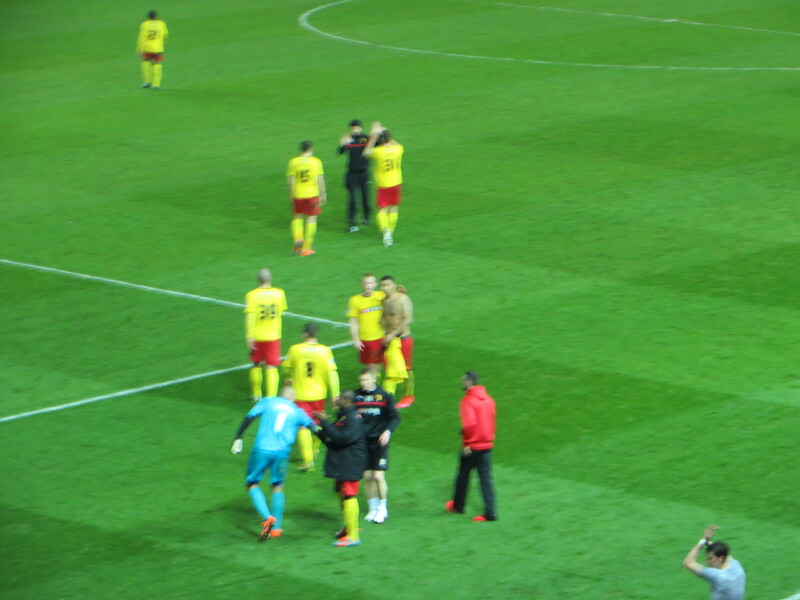 Watford threatened again as Guedioura picked up a loose ball and broke into the box, his shot was saved by Grant and Deeney was unable to connect for the follow-up. Another good Derby cross was missed by Bent, who then got the ball stuck under his feet when he found himself on the edge of the Watford area, so did not threaten the goal. Ince then broke into the box but his shot was deflected for a corner. Derby equalized just before half-time. I must admit that my first impression of Motta’s challenge on Russell was that it had been a brilliant tackle, so I was gutted when Kevin Friend first pointed to the spot and then showed Motta a red card. Not again!! Bent, whose goal attempts so far had been somewhat wanting, stepped up and beat Gomes from the spot. Needless to say, the conversation at half time was about the penalty incident. Texts from friends watching the game on TV shared the pundits’ opinion that it was a penalty but the card was harsh. Whatever the truth of the matter, we felt hard done by and were not relishing the prospect of the second period. At the start of the second half, it was no surprise when Jokanovic sacrificed one of the strikers for Tözsér. 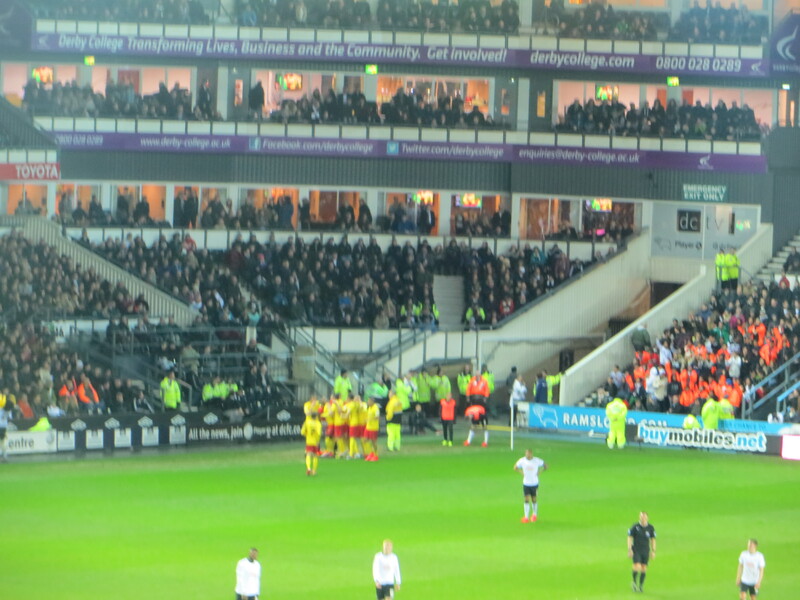 The only surprise was that it was Vydra who went off rather than Ighalo, who had had a rather frustrating first period. The visitors started the half well and there was a taste of things to come as Guedioura played a lovely through ball for Deeney who, unfortunately, couldn’t reach it. Deeney then had a couple of chances to regain the lead with, first, a header from a Tözsér free-kick that needed a good save from Grant to keep it out. Then the ball found its way back to Troy but his shot from distance was wide of the target. But it was the home side who took the lead as Ince skipped into the box and shot into the far corner past Gomes. My heart sank. Jokanovic decided to change things bringing Anya on for Layun. The next notable action was another booking, this time for Deeney, for what could only be described as a coming together that ended with Shotton rolling dramatically on the ground. What was particularly galling about this card was that Deeney was trying to get the ball near the Derby penalty area. If you can’t challenge for a ball in that area of the field, you might as well give up. An attempted forward break by Ince was stopped by a lovely tackle. The Watford equalizer was a thing of beauty and played out right in front of us, so we got a wonderful view as Guedioura played a peach of a pass into the path of Ighalo who coolly tucked it past Grant sparking mayhem in the away end. It was no more than we deserved at that point as we’d had a great spell. McLaren reacted to the goal by bringing Chris Martin on. A moment of carelessness soon after nearly undid all our good work as Ighalo gave the ball away to Bent who advanced and shot but was foiled by the legs of Gomes. Jokanovic made a defensive substitution sacrificing Ighalo, who left the field to loud chants of his name, for Connolly. It was backs against the wall stuff for the last 10 minutes. 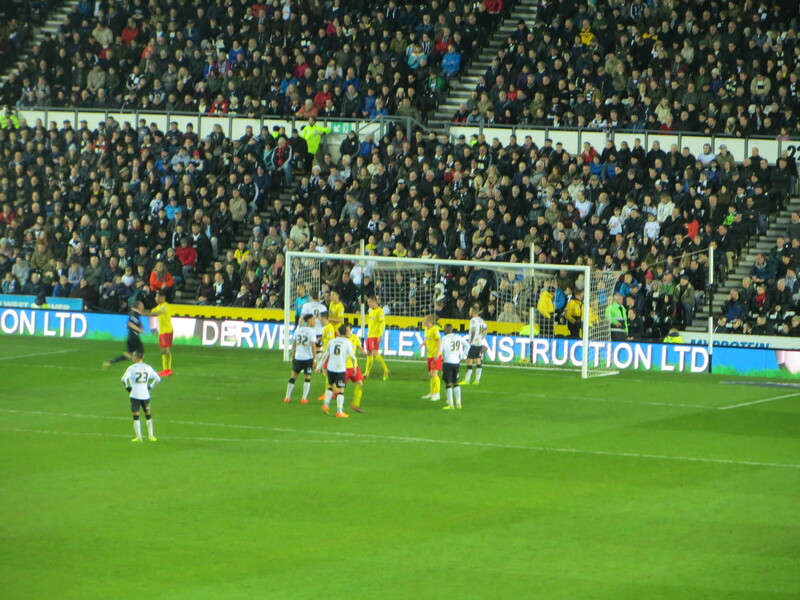 Ince had a great chance to regain the lead for Derby as he turned and shot but directed his effort over the bar. Hearts were in mouths as Angella tried to shepherd the ball out but had the ball nicked off his feet by a Derby player whose cross was cleared by Cathcart. The fourth official held up the board to show six added minutes. “Where did he get 6 minutes from,” asked the bloke next to me. “McLaren” was my churlish reply. My abiding memory of those interminable minutes was of 10 Watford players lining up across the field deep in their own half, which seemed a bit risky but the only real goal chance that the home side had was the last action of the game as a header from Keogh was brilliantly tipped over by Gomes. The whistle went to huge cheers from the travelling Hornets. The Derby players slumped to the ground, they needed 3 points from this game. Our lads were completely exhausted and I was trembling due to the stress of the previous 20 minutes. The players were given such a rapturous reception that you would have thought they’d won the game. Nobody seemed to want to leave the away stand, it was reminiscent of games in the 80s when we were kept in for 15 minutes after the final whistle. So we were all still there when Guedioura came over after receiving his man of the match award and was given a hero’s ovation and responded in kind. Post match drinks went on long into the night with reflections on how much fun we’ve had following Watford this season. We need a win on Monday, but the brave second half performance has set us up rather nicely. It’s good to be home. This entry was posted in Watford FC and tagged Adlene Guedioura, Ben Watson, Chris Martin, Craig Bryson, Craig Cathcart, Craig Forsyth, Cyrus Christie, Daniel Tozser, Darren Bent, Derby County FC, Gabriele Angella, George Thorne, Heurelho Gomes, Ikechi Anya, Jeff Hendrick, Jesse Lingard, Johnny Russell, Lee Grant, Marco Motta, Matej Vydra, Matthew Connolly, Miguel Layun, Odion Ighalo, Richard Keogh, Ryan Shotton, Slavisa Jokanovic, Tom Ince, Tommie Hoban, Troy Deeney, Watford FC, Will Hughes on April 5, 2015 by franelynn.